Mumbai: The most-awaited film of the year, Salman Khan starrer Bharat, which is all set to hit the theatres on Eid, has released the first look poster from the film. The first look poster shows the lead actor Salman Khan in a never seen before avatar. 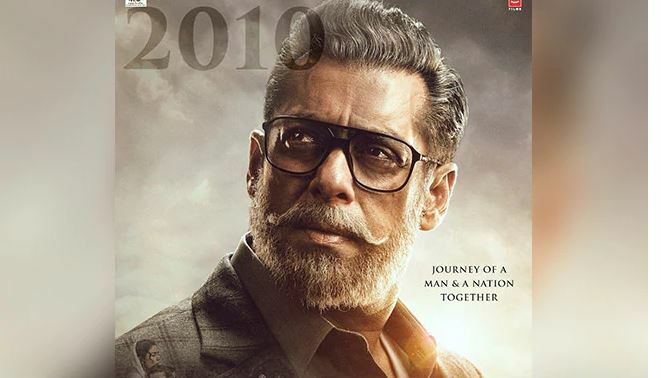 With grey hair and rimmed spectacles, Salman is seen as an old aged man, but the actor, however, has promised a colourful journey. Also in the poster, we can see Jackie Shroff along with his wife running away with their children which symbolizes the partition period the country went through. The film will show the journey of the country from its early days of independence to till now as the lead character also named Bharat grows along with the nation. On the poster is also the number ‘2010’ which might signify his look in the year 2010. The film, which is an adaptation of the South Korean hit Ode to My Father, also features Katrina Kaif, Sunil Grover, Tabu, Disha Patani and Jackie Shroff in significant parts. Bharat has been jointly produced by Atul Agnihotri, Alvira Khan Agnihotri, Bhushan Kumar, Krishan Kumar and Salman Khan. It is set to hit theatres on June 5.